Adobe & Mettle SkyBox products: 360 degrees better. 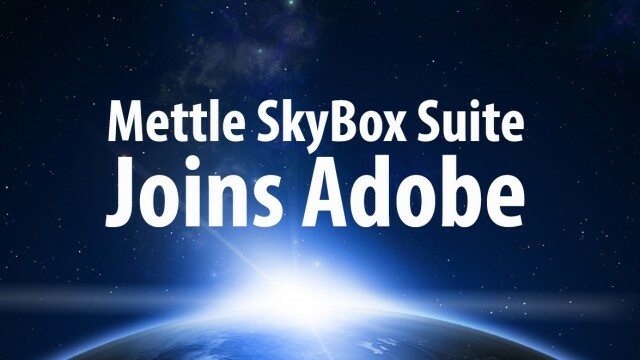 We are very proud to announce that Adobe has acquired SkyBox Suite*. We believe this is a winning scenario for our customers, Adobe, and Mettle, in a move that will advance and further democratize the 360/VR medium. Our plugins have been recognized as best-in-class by Adobe and 360/VR content creators worldwide, making the SkyBox Suite a logical addition to the Adobe Creative Cloud offering. This means that complete 360/VR production workflows will be available to all Adobe customers who hold subscriptions for After Effects, Premiere Pro or the full Creative Cloud, by the end of the year. A huge thank-you to everyone who has bought our plugins. Kudos to all the 360° pioneers. As of October 18, 2017, Adobe has fully integrated the SkyBox Suite of plugins into Creative Cloud. Adobe has more information about this integration on their website. Tech support is also now available from Adobe. For support, please contact Adobe support team or check out the free tutorials for After Effects or Premiere Pro. See Immersive Transitions features in action for Premiere Pro and check out this tutorial on how to use them in your next project! See Immersive Effects in action for After Effects and check out this tutorial on how to apply them in your next project! What Does This Mean for Mettle SkyBox Customers? Your project files should work in Adobe CC 2018 with the new Immersive tools, formerly SkyBox plugins. What Does This Mean for Mettle? Adobe is acquiring the SkyBox Suite of 360/VR plugins, which are designed exclusively for post-production in Adobe Premiere Pro and Adobe After Effects. Additionally, Chris Bobotis, co-founder of Mettle, is joining Adobe as a Director, Immersive. Mettle will continue as an independent company with a mission to develop innovative software tools for content creators. Nancy Eperjesy, co-founder of Mettle continues as CEO. Adobe and Mettle are committed to create a seamless integration for Creative Cloud subscribers by providing uninterrupted service and customer support during the transition. FreeForm, FreeForm Pro and ShapeShifter AE, After Effects 3D plugins that are 360 compatible, are still available and now have a lower price tag. can i run skybox mettle with cc2017 ? I am so thankful for this Adobe and mettle, great idea! That’s awesome news, congratulations!! Can’t wait to start working with all of the plugins! Wow, and congrats, most people could see this coming a mile a way, and it’s not a bad thing. Good luck during this shift.